I had a grand plan, dear reader. I planned to shed quantitative light on the problem of income inequality. And I planned to do it with a million games of web-scraped Scrabble tournament data. But, like in Scrabble, where the best-laid plans sometimes leave you holding a rack full of vowels and nowhere to play them, I was left with unanswered questions and a pile of data. Turns out that Scrabble can’t explain a core economic concept. But please bear with me. There’s a data party favor at the end. Inequality has skyrocketed in the U.S. over the past half-century, documented in great detail by all sorts of folks. One theory for the widening gap between the 1 percent and the 99 percent is technological change: When new technologies emerge, higher-skilled and higher-earning workers can more quickly adapt to and exploit them, the notion goes. They become more effective at work and can earn even more, and the gulf widens. 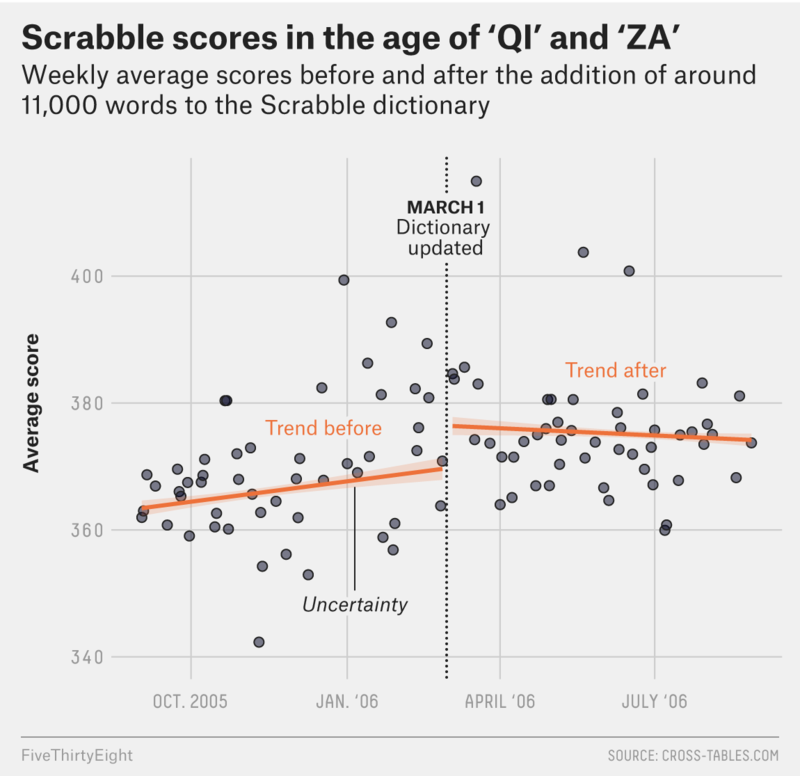 There has been dramatic “technological” change in Scrabble, too, and it involves dictionaries. Every weekend, in hotel ballrooms, empty offices and fast-food restaurants across the country, tournament Scrabble players take their seats, two to a board, to place the game’s 100 lettered tiles. This is the Scrabble “economy.” Governing the interactions in this economy is a dictionary full of tens of thousands of allowed words. Every so often, the book gets even thicker — Scrabble’s “technology” improves. About a decade ago, there was an actual technological revolution in the game: Its training tools went digital, allowing players to learn words and strategies more easily. In 2006, an early version of Zyzzyva, a now-indispensable word-study tool, was first publicized, and Quackle, a Scrabble analysis engine and A.I. sparring partner, was publicly released. But what other effects did this technical lexical revolution have? Did better players more effectively exploit these new words, increasing their average score more than their mediocre weekend counterparts? Did the Scrabble rich get Scrabble richer? Did income — ahem, point-scoring — inequality increase? FiveThirtyEight believes in showing its work, which is why you read this piece of scratch paper and why we’ve posted the data to GitHub. If you find anything interesting, or end up using this in your economics dissertation, let me know! A third edition of the dictionary took effect in 2015, adding nearly 9,000 words. The list was slightly updated yet again, in 2016, with an additional 1,000 words, but they are practically useless long words such as DONKEYMAN, FROGMOUTH and HORSEMEAT. The earliest games in the database date to 1973; individual game scores begin to be included in 1983; and scores are reliably included beginning in the mid-2000s. 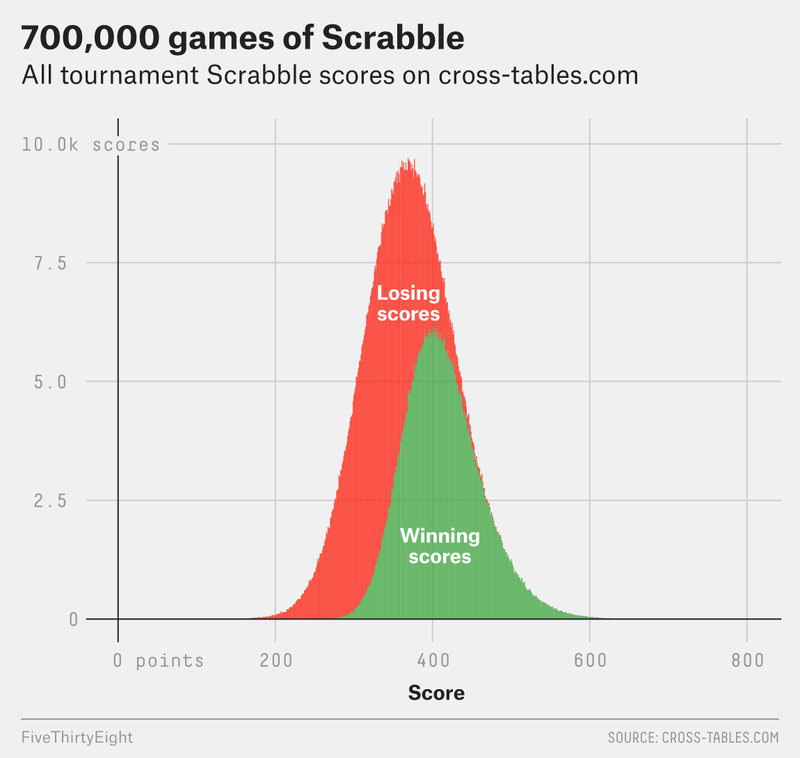 The data covers about 15,000 Scrabble players competing in over 7,000 individual tournaments.